Shunryu Suzuki (鈴木 俊隆 Suzuki Shunryū, dharma name Shogaku Shunryu) (May 18, 1904 - December 4, 1971) was a Soto Zen priest born in the Kanagawa Prefecture of Japan. Suzuki was occasionally mistaken for the Zen scholar D.T. Suzuki, to which Suzuki would reply, "No, he's the big Suzuki, I'm the little Suzuki." On May 18, 1904 Shunryu Suzuki was born as Toshitaka Suzuki at Shogan-ji, a small village Soto Zen temple near Hiratsuka in Kanagawa Prefecture. His father, Butsumon Sogaku Suzuki, was head abbot of the temple and was married to his wife Yone. Yone was the daughter of a Zen priest in Hamamatsu. This was her second marriage. Yone's first husband divorced her for being strong willed and too independent minded. The family lived in the Buddha Hall at the temple. Suzuki's family was a struggling one, his mother and father working various menial jobs to make ends meet. In 1910, at age 6, Suzuki became a student. This was when he realized his family was much poorer than most. His clothes, shoes and haircut were different from others. In school Suzuki had a hard time with hanging on to things, losing homework and books. Suzuki grew up in a world of formality and customs. In elementary school Suzuki began to have doubts about being ordained by his father. He just couldn't view him as a teacher. Almost 12 now, in 1916, Suzuki decided to train with a former disciple of his father, Gyokujun So-on Suzuki. So-on was Sogaku's adopted son, and abbot of Sokagu's former temple Zoun-in. His parents initially thought he was too young to live far from home, but eventually allowed it. Zoun-in is located in a small village called Mori, Shizuoka in Japan. Suzuki arrived during a 100 day sitting period at the temple, and was the youngest student there. Zoun-in was a much larger temple than Shoganji. At 4 a.m each morning he would arise for zazen. Next he would chant sutras and begin cleaning the temple with the others. They would work throughout the day and then, in the evenings, they all would resume zazen. Suzuki idolized his teacher, who was a strong disciplinarian. So-on often was rough on Suzuki, but gave him some latitude for being so young. When Suzuki turned 13, on May 18, 1917, So-on ordained him as a novice monk. He was given the Buddhist name Shogaku Shunryu, yet So-on nicknamed him Crooked Cucumber for his forgetful and unpredictable nature. Shunryu began again attending upper-elementary school in Mori, but So-on did not supply proper clothes for him. He was the subject of ridicule, but in spite of his misfortune he wouldn't complain. Instead he doubled his efforts back at the temple. When Shunryu had first come to Zoun-in, 8 other boys were studying there. By 1918, he was the only one who stayed with So-on. This made his life a bit tougher with So-on, who had more time to scrutinize him. During this period Suzuki wanted to leave Zoun-in but equally didn't want to give up. In 1918 So-on was made head of a second temple, on the rim of Yaizu, called Rinso-in. Shunryu followed him there and helped whip the place back in order. Soon, families began sending there sons there and the temple began to come to life. Suzuki had failed an admissions test at the nearby school, so So-on began teaching the boys how to read and write Chinese. So-on soon sent his students to train with a Rinzai master for a while. Here Shunryu studied a very different kind of Zen, one that promoted the attainment of satori through the concentration on koans through zazen. Suzuki had problems sitting with his koan. meanwhile all the other boys passed theirs, and he felt isolated. Just before the ceremony marking their departure Suzuki went to the Rinzai teacher and blurted out his answer. The master passed Suzuki, but later Shunryu believed he had done it simply to be kind. In 1919, at age 15, Suzuki was brought back home by his parents, who suspected mistreatment by So-on. Shunryu helped out with the temple while there, and entered middle school. Yet, when summer vacation came, he was back at Rinso-in and Zoun-in with So-on to train and help out. He himself didn't want to stop training. In school Suzuki took English and did quite well in learning it. A local doctor, Dr. Yoshikawa, even hired him to tutor his two sons in English. Yoshikawa treated Suzuki well, giving him a wage and occasional advice. In 1924 Shunryu enrolled in a Soto preparatory school in Tokyo not far from Shogan-ji, where he lived on the school grounds in the dorm. From 1925 to 1926 Suzuki did Zen training with Dojun Kato in Shizuoka at Kenko-in. He continued his schooling during this period. Here Shunryu became head monk for a 100 day retreat, after which he was no longer merely considered a novice. He had completed his training as a head monk. In April of 1926 Shunryu graduated from preparatory school and entered Komazawa Daigakurin, a university which also taught Soto Zen. During this period he continued his connections with So-on in Zoun-in, going back and forth whenever possible. On August 26, 1926, at age 22, So-on gave Dharma transmission to Suzuki. Shunryu's father also retired as abbot at Shogan-ji this same year, and moved the family onto the grounds of Zoun-in where he served as inkyo (retired abbot). Later that year Suzuki spent a short time in the hospital with tuberculosis, but soon recovered. In 1927 an important chapter in Suzuki's life was turned. He went to visit a professor in English he had at Komazawa named Miss Ransom, a woman who had taught English to such people as Jiro Kano and the children of Chinese president Li Yuanhong. She hired him that day to be a translator with others and to help with errands. Through this period he realized she was very ignorant of Japanese culture and the religion of Buddhism. She respected it very little and saw it as idol worship. But one day, when there were no chores to be done, the two had a conversation on Buddhism that changed her mind. She even let Suzuki teach her zazen meditation. This experience is significant in that Suzuki realized that Western ignorance of Buddhism could be transformed if they were educated on exactly what it is. On January 22, 1929, So-on retired as abbot of Zoun-in and installed Shunryu as its 28th abbot. Sogaku would run the temple for Shunryu. In January 1930 a ceremony called ten'e was held at Zoun-in for Shunryu acknowledging So-on's Dharma transmission to him. A way for the Soto heads to grant him permission to teach as a priest. On April 10, 1930, at age 25, Suzuki graduated from Komazawa Daigakurin with a major in Zen and Buddhist philosophy, and a minor in English. Suzuki mentioned to So-on during this period that he may be interested in going to America to teach Zen Buddhism. So-on was adamantly opposed to the idea. Suzuki realized that his teacher felt very close to him and that he would take such a departure as an insult. He did not mention it to him again. Upon graduation from Komazawa, So-on wanted Shunryu to continue his training at the well known Soto Zen temple in Fukui Prefecture known as Eiheiji. In September of 1930 Suzuki entered the training temple and underwent the Zen initiation known as tangaryo. His mother and father stayed on at Zoun-in to care for his temple in his absence. Eiheiji is one of the largest Zen training facilities in Japan, and the abbot at this time was Gempo Kitano-roshi. Prior to coming to Japan, Kitano was head of Soto Zen in Korea. He also was one of the founders of Zenshuji, a Soto Zen temple located in Los Angeles, California. Suzuki's father and Kitano had a tense history between them. Sogaku had trained with Kitano in his early Zen training and felt that he was such a high priest due to familial status and connections. Shunryu did not see this in Kitano, however. He saw a humble man who gave clear instruction, and Shunryu realized that his father was very wrong in his assessment. Often monks were assigned duties at the monastery to serve certain masters. Shunryu was assigned to Ian Kishizawa-roshi, a well known teacher at the time who had previously studied under two great Japanese teachers: Oka Sotan and Nishiari Bokusan. He was a renowned scholar on Dogen's Shobogenzo, and was also an acquaintance of his father from childhood. Kishizawa was strict but not abusive, treating Suzuki well. Suzuki learned much from him, and Kishizawa saw a lot of potential in him. 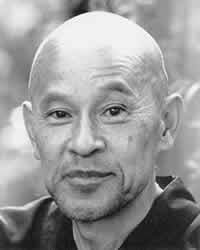 Through him Suzuki came to appreciate the importance of bowing in Zen practice through example. In December Suzuki sat his first true sesshin for 7 days, an ordeal that was challenging initially but proved rewarding toward the end. This concluded his first practice period at Eiheiji. In September of 1931, after one more practice period and sesshin at Eiheiji, So-on arranged for Suzuki to train in Yokohama at Sojiji. Sojiji was the other main Soto temple of Japan, and again Suzuki underwent the harsh tangaryo initiation. Sojiji was founded by the great Zen master Keizan and had a more relaxed atmosphere than Eiheiji. At Sojiji Suzuki travelled back to Zoun-in frequently to attend to his temple. In 1932 So-on came to Sojinji to visit with Shunryu and, after hearing of Suzuki's contentment at the temple, advised him to leave it. In April of that year Suzuki left Sojiji with some regret and moved back in to Zoun-in, living with his family there. In May he visited with Ian Kishizawa from Eihiji and, with So-on's blessing, asked to continue studies under him. He went to Gyokuden-in for his instruction, where Kishizawa trained him hard in zazen and conducted personal interviews with him. Sometime during this period Suzuki married a woman who contracted tuberculosis. The date and name of this woman is not known to us, but the marriage was soon annulled. She went back to live with her family while he focused on his duties at Zoun-in. On May 23, 1959 Suzuki-roshi arrived in San Francisco, CA to attend to Soko-ji, at that time the sole Soto Zen temple in San Francisco. Suzuki took over for the interim priest, Wako Kazumitsu Kato. Suzuki was taken aback by American culture, and was surprised to see that Sokoji was previously a Jewish synagogue. His sleeping quarters were located upstairs, a windowless room with an adjoining office. At the time of Suzuki's arrival, Zen had become a hot topic amongst some groups in the United States, especially beatniks. Particularly influential were books by Alan Watts, who wrote several books on Zen and Buddhism. Word began to spread about Suzuki among the beatniks through places like The San Francisco Art Institute and The American Academy of Asian Studies, where Alan Watts was once director. Kato had done some presentations at the Academy and asked Suzuki to come join a class he was giving there on Buddhism. The class was filled with those wanting to learn more about Buddhism, and the presence of a Zen roshi was inspiring for them. Suzuki had the class do zazen for 20 minutes, sitting on the floor without a zafu and staring forward at the white wall. In closing, Suzuki invited everyone to stop in at Sokoji for morning zazen. Little by little more and more people would show up each week to sit zazen for 40 minutes with Suzuki on mornings. The students were improvising, using cushions borrowed from wherever they could find them. The predominantly Caucasian group that joined Suzuki to sit eventually formed the San Francisco Zen Center with Suzuki. The Zen Center flourished so that in 1966, at the behest and guidance of Suzuki, Zentatsu Richard Baker helped seal the purchase of a hot springs resort in Los Padres National Forest which they called Tassajara Zen Mountain Center. Soon thereafter, they bought a building at 300 Page Street near San Francisco's Lower Haight neighborhood and turned it into a Zen temple. Suzuki left his post at Sokoji to become the first abbot of the first Buddhist training monastery outside of Asia. A collection of his teishos (Zen talks) were bundled in the books Zen Mind, Beginner's Mind and Not Always So: Practicing the True Spirit of Zen. His lectures on the Sandokai are collected in Branching Streams Flow in the Darkness. Suzuki's biography is captured in David Chadwick's 1999 book Crooked Cucumber. "So the secret is just to say 'Yes!' and jump off from here. Then there is no problem. It means to be yourself, always yourself, without sticking to an old self." "Take care of things, and they will take care of you." "My life has been one long series of mistakes." "The way that helps will not be the same; it changes according to the situation." Suzuki, Shunryu (1970). Zen Mind, Beginner's Mind. Weatherhill. ISBN 0-8348-0079-9. Suzuki, Shunryu (2002). Not Always So: Practicing the True Spirit of Zen. HarperCollins. ISBN 0-06-095754-9.